There are some really fun and inventive Thanksgiving leftover ideas out there. The first dish that always comes to mind is Pink Parsley’s Turkey Cranchiladas. Different. Fun. And completely delicious. And more importantly, they look nothing like lunch and dinner from the previous 3 days. We stirred a couple of minced chipotles in adobo into some leftover cranberry sauce for a more savory – and slightly spicy – take on the spread. And just like that, 5 ingredients puts another leftover dinner on the table in the form of quesadillas, but with just enough of a twist to make it almost feel like a completely different meal. Thanksgiving leftovers get a fresh twist with an easy chipotle cranberry sauce. 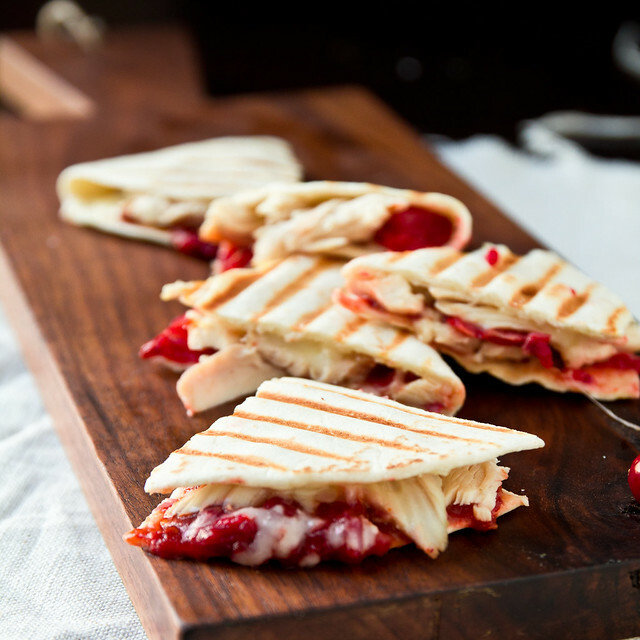 Heat a grill pan or panini maker to high. Mix the cranberry sauce and minced chipotles together. Lay the tortillas on your work surface and spread a spoonful of cranberry sauce over half. Top with turkey and cheese and fold the top half over. Grill 2-3 minutes on each side, until nicely browned and crispy. Cut each quesadilla into 2-3 pieces and serve hot. What an awesome way to use up Thanksgiving leftovers! I especially love that chipotle cranberry sauce! YUM! Love this! Looks so delicious!! Love this creative idea and great flavor combos too! 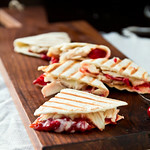 I’m thinking brie inside those quesadillas…mostly because I’m a brie and cranberry sauce fiend!! I love leftovers and my favorite sandwich makes me more excited for the day after meal…but this could get a spot in the leftover rotation for sure. Sounds great and looks simple but beautiful. Very nice. I know I’ll be stoned for saying this, but I’ve never been a fan of Thanksgiving leftovers…until now. I can’t wait for Friday to try this out (and I love the brie suggestion)! !